Today I'm going to rant. “New, unique ways to save money” have become the bane of my existence. I loathe these requests. Why? Because the basics of personal finance never change. They haven't changed in thousands of years, and they're not going to change for thousands more. Fundamentally, all you need to know about managing your money is this: Spend less than you earn. That's it. If you spend less than you earn, you'll do fine. Everything else is details. Those details are important, I know, but most of them are common sense and widely known. Reporters don't want to hear that the best ways to save money are to cut cable television (and other monthly expenses), start a vegetable garden, clip coupons or buy a used car. No no no. These ideas aren't good enough. So, you end up with articles that claim they'll save readers $5,000 a year — but only if you can get rid of your hot tub or ditch your pet ostrich or give up the vacation home on the lake. In other words, by constantly striving for new, unique ways to save money, reporters make their articles mostly useless. Instead, I think reporters should have the guts to promote the basics. Why? Because they work. We've covered this a zillion times before — including a four-part series in April during which I described my core financial framework — but let's do a quick review. If you spend more than you earn, you have a negative cash flow. You're losing wealth and in danger of going into debt. 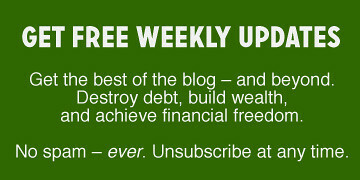 (Or, if you're already in debt, you're digging the hole deeper.) If you spend less than you earn, you have a positive cash flow, which will let you climb out of debt and build wealth. Earning — Your ability to bring in money. This skill requires resourcefulness and a willingness to work. Spending — Your ability to live frugally and spend wisely. This skill generally requires sacrifice and the ability to prioritize. Investing — Your ability to produce a surplus and to make that surplus grow. This skill takes patience and research. Spend less than you earn — invest the difference. That's all you need to know. The rest is developing the mindset and skills to make these things happen. When I spoke with her, the truth was even worse. She was looking for advice on things recent graduates should buy. “When you're out of college, you don't have much of an income, and you may not have a job. If that's the case, what should someone spend money on?” she asked. I was dumbfounded. I offered some lame answers — it's okay to spend on a wardrobe (if your job requires it) or further education — but in the end, I gave up. Note: I don't mean to pick on this one reporter. She's just fresh in my mind. Her requests and approach are very, very typical of most other reporters I've talked with. This is what happens when you're constantly trying to find new and unique ways to save money. You start by chasing narrow niche topics (“The pitfalls of insurance if you carshare”, “How to save on silk underwear”, “How the BAH helps military members afford a home“) and eventually you're writing nonsense like “10 things every college graduate should buy”. I reject the relentless push for new, unique money tips. They're few and far between. Besides, there are millions of people who can profit from hearing the old advice. For many, the old advice is new advice. And even those who've heard it many times before can benefit from hearing it again. If you want to write a story about personal finance and you're worried that readers will be bored because you're covering the same topics everyone else has covered for the past hundred years, the solution isn't to look for new, unique ideas. The solution is to find new, unique ways to convey the timeless information that works. Find real-life examples (like the GRS reader stories). Explore government statistics. Find a new angle into the story (psychological? religious? political?). But don't turn your back on the basics just because they seem tired and worn out. The basics are the basics for a reason. And until everyone grasps the concept, the fundamental formula of personal finance needs to be trumpeted from the rooftops: To build wealth, you have to spend less than you earn. It's not new. It's not unique. It's simply the truth.